Golden delicious apple trees are a favorite apple variety for a home gardener to grow. With a bountiful harvest of flavorful, all-purpose apples, golden delicious apples have a thin, tender skin that is perfect for cooking, baking and eating. This apple variety does need to experience temperatures in the 32 to 40 F range for an extended time during its dormant period of winter. Therefore, golden delicious apple trees will not grow well in USDA hardiness zones eight through 11 since they do not provide the chill time needed. Prune your golden delicious when you plant it to begin training it and increase future bud production. This should entail cutting back and removing unwanted branches which will start training your tree to the shape you desire. Your goal should be to develop branching at manageable heights. At planting, cut back your tree to a height of 24 to 30 inches. This will encourage bud development below the cut line and balance the upper portion of the tree to the root system. Continue pruning your golden delicious apple tree every year in the late winter. Remove branches that crowd, cross over, and inhibit an open growth. Top, or cut, new growth by one-quarter to stimulate bud development. Always remove any suckers, diseased and broken branches. Apply 1 cup of ammonium sulfate (nitrogen) or well-rotted manure one month after planting, or when your new tree has grown 6 inches. The ammonium sulfate feeding should be broadcast over the soil in a circle around the tree. The fertilizer needs to be spread about 2 feet out from the truck, but no closer than 6 inches to the trunk base. Repeat this feeding of your new tree in May and June. The second year, feed your golden delicious apple tree in the same manner and the same quantity in April, May and June. The following year, increase the amount to 2 cups, and increase the distance out from the tree to 3 feet. Water your golden delicious apple tree so it receives approximately 1 inch of water per week. If your tree is in your landscape, your regular watering schedule should be sufficient, but never let your tree go without water for more than three weeks. 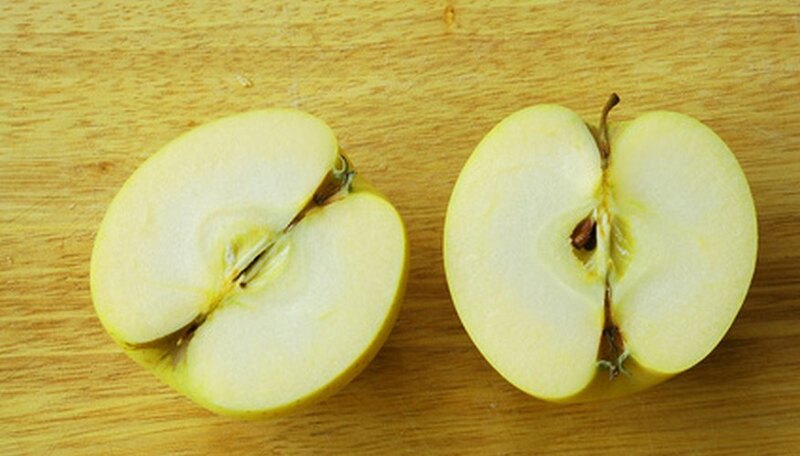 Thin the fruit to no more than two apples per cluster on your tree when the apples are 3/4 inch in size. Thinning the fruit will improve apple size and improves development of next year's buds. Plant a golden delicious tree that is no more than one year old. Older trees may not have a adequate buds and weaker roots. Before starting a fertilizer or feeding program, it is wise to have your soil tested at your local agricultural extension office. This will tell you if you need to supplement potassium or phosphorus. Normally, apple trees do not need extra potassium or phosphorus feed, only additional nitrogen, but having your soil tested will be the only way to know. Make sure you have planted your golden delicious apple tree where it will receive at least six to eight hours of sunlight a day. Inadequate exposure to sun will dramatically decease fruit production. Do not add any fertilizer to the soil or feed your tree when you plant it, but wait at least one month for the roots to establish themselves. SF Gate: Coastal Areas Not Best for "Golden Delicious"